A flat metal tool, about 3" long, perfect for weaving silk ribbon into a project. It also works well for filling tubular nylon threads like Rachel or Flair with other threads for color accent. Perfect for huck embroidery on monk’s cloth. These sharp point needles are polished with a unique process that minimizes breaking thread and results in smooth glide. Very strong, minimum bending. Packs of 6. Available in sizes: 18, 20, 22. 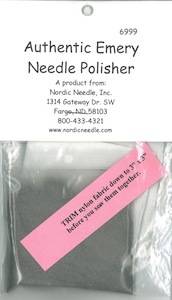 These needles are polished with a unique process that minimizes breaking thread and results in smooth glide. Very strong, minimum bending. Packs of 6. Available in sizes: 18, 20, 22, 24, 26, 28. 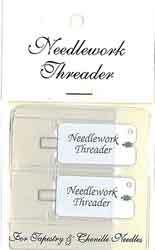 Bullion Needles are perfect for making 1" or larger bullions and other wrapped stitches. They have sharp points and are available in 5" and 7". Wire threader with a metal guide plate to help steady the needle as it is being threaded. Large opening for easy threading. Contains one each of sizes 20, 22 and 24. Stitch on fabric-covered boxes or use for teneriffe lace. 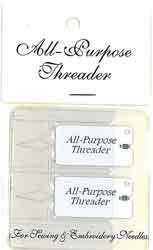 Great for adding a stitch or fixing a mistake after a piece has been framed or finished. Same size eye as regular tapestry needle, but has shorter barrel. Blunt point, best used for needlepoint. Available in packs of 6. Available in sizes: 18, 20, 22, 24, 26, and 28. Fine diamond-shaped memory wire embedded in a sturdy plastic disk. 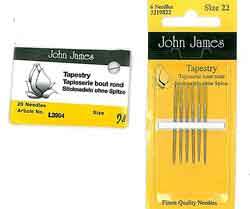 Ideal for threading Sharps, Embroidery, Milliners and Betweens, sizes 1 to 10. Also has a safe recessed cutting blade for quickly snipping a thread. 2 threaders per pack. 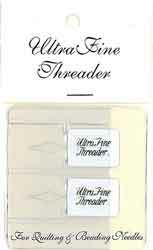 Contains one each of the Ultra Fine, All-Purpose, and Needlework Threaders, in a handy vinyl organizer pack. For tapestry and chenille needles. This threader will even work in the eye of a #28 needle. 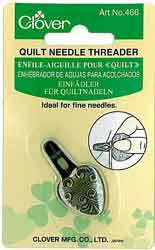 Unique square-shape threader allows thread to spread out as it is pulled through the needle eye. A safe recessed cutting blade is built in for quickly snipping a thread. 2 per pack. Super-fine diamond-shaped memory wire embedded in a sturdy plastic disk. 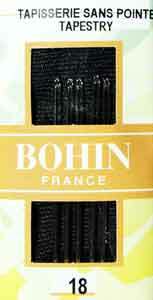 Designed for threading very fine quilting, beading and heirloom sewing needles. The delicate threader wire does have a sharp point and must be handled with care. 2 per pack. Sturdy all-steel design is great for thicker thread.